Here in Buffalo, we’re lucky to be surrounded by two Great Lakes and tons of finger lakes, which means pretty much guarantees that you’ll see an Insta story of someone on a boat every. single. weekend. The FOMO is real. Are we missing a boat rental option? We want to know about it – email us at info@stepoutbuffalo.com! What They Offer: Enjoy a day of fishing or relaxing on the beautiful Niagara River courtesy of Collins Marine. You can rent either a 24′ 60HP pontoon or 24′ 115HP pontoon. Prices range from $295 for five hours all the way up to $1,700 for an entire week. Their handy dandy chart makes it easy to select the perfect option for your outing. Rental prices do not include tax and fuel fees. Each pontoon comes fully equipped with safety gear so you and your friends are hit the water and stay safe at the same time. What They Offer: So this isn’t technically a pontoon but you can sail and get drunk so we obviously had to include it on this list. You can book by the seat ($40 per person) or boat the whole boat, which holds 15 people and costs $37.50 per person. This adventure is BYOB for beer and wine so head to your nearest Consumer Beverage and pick up some beer (in cans) or wine (bring plastic cups). 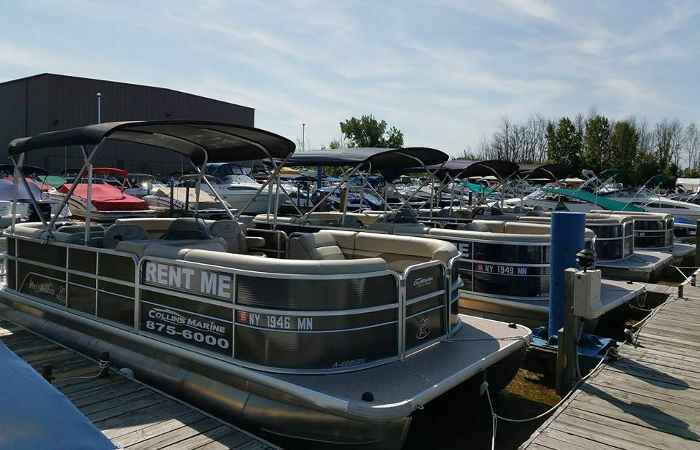 What they offer: These guys are located on Chautauqua Lake and offer a huge variety of rentals including power boats, pontoons, fishing boats, pedal boats, and kayaks. They rent power and pontoon boats by the hour, and the others by the day and are relatively affordable., plus you can rent skis and tubes here too. Into it. Looking to head out on a smaller lake for the day? This Conesus Lake Boat Rental has a few different sized pontoon boats available for daily rental as well as a 20′ Fiberglass Bow Rider Bayliner, and kayaks. What They Offer: Make Sail offers private charters with licensed captains and owners Rich and Mary Bennett. They offer a standard informational tour or a personalized sailing experience with no experience required. Call or email to book: 716-866-1964 / captain@makesailtime.com. What They Offer: Head to Silo City for an incredible water adventure. Prices vary based on how long you plan on renting a single or tandem kayak. You can rent one for an hour ($20 single; $25 tandem) and then for every additional half hour, you’ll be charge $5. Or you can rent either for an entire day – $55 for a single kayak and $65 for a tandem. What They Offer: BLFO Harbor Kayak is all about options. Choose from a single kayak, a tandem or a stand-up paddle board. Depending on which one you choose and the duration of your excursion, be prepared to spend between $20 – $75. You can also book a guided tour here. 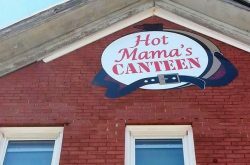 What They Offer: Head to the Mutual Riverfront Park at the Corner of South and Hamburg St. where either your single kayak ($25 for 2 hours) or tandem ($45 for 2 hours) will be waiting for you. If guided tours are your thing, Elevator Alley Kayak’s staff is ready to teach you about the historic Buffalo River. What They Offer: Riverworks has a fleet of single and tandem kayaks and paddleboards for rent (Independent Health members receive a discount). Pro tip: The Riverworks launch docks are part of the new Buffalo Blueway system and are free for any paddler to use whether you rent or bring your own kayak, canoe or paddleboard. Don’t forget there is a drive up boat drop off if you bring your own.